Since printed circuit boards began to reduce the footprint of the board, PCB design and board integration have become increasingly complex. In the era of microprocessors, standard single and double layer board can not handle the interconnection of dense terminals and processors, especially with multiple chips on board. 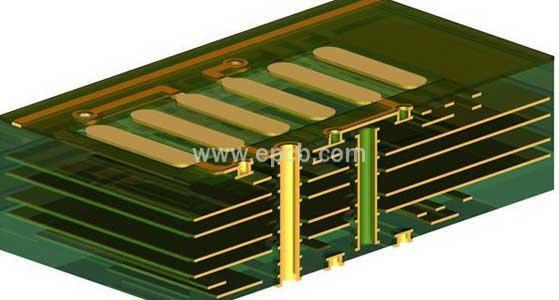 Multilayer PCB is similar to an ordinary PCB in size and structural features. To facilitate the huge interconnection between complex chips, multilayer PCB board uses multiple layers to arrange the number of traces of each row, thereby reducing the overall footprint. The standard computer processor chip has 450 to 500 pins, approximately 40x40mm in size. Typically, multilayer PCB range from four to five layers, some particular exterme board can use up to 20 layers to complete the necessary routing. Our phone usually needs up to 16 layers to generate an effective system in a smaller space. You can found that standard CAD software like Eagle supports up to 16 layers. Multilayer PCB is made by stacking copper layers separated by a thin layer of dielectric and an adhesive material called prepreg. Prepreg combines the copper conductor with the dielectric layer that are in-between them. The interconnections between two layers is made through vias. Multilayer PCBs provide the benefits of a dedicated power ground and reference signals. And this helps to reduce the routing complexity in single and double-layer PCBs. PCB manufacturing process requires the completion of all the default processes to fabricate a single layer for each single layer in the board, and there is no doubt that the cost of multilayer PCB manufacturing are much higher. The overall fabrication process of multilayer PCBs also consumes more time. Besides, unlike the double-sided board, it is impossible to repair a multilayer PCB.